Yesterday’s Cuyahoga Falls Press included a story about students at Cuyahoga Valley Christian Academy packaging meals to be sent to starving children in Third World countries. The story quoted seniors Cassie Bogden and Joshua Kontur (pictured at right), both who attend the Western Reserve Grace Brethren Church (Jason Haymaker, pastor) in Macedonia, Ohio. Among the adults helping was Je’Rod Cherry, former New England Patriot who last fall raffled off one of his championship Super Bowl rings to benefit numerous charities. Cuyahoga Falls — Students at Cuyahoga Valley Christian Academy heeded God’s call to feed the hungry, packaging around 108,000 meals to be sent to Third World countries. One of the event’s student organizers said she wanted to take an active role in saving lives. 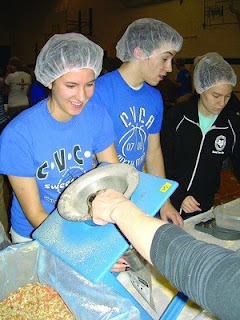 Cassie and senior Joshua Kontur of Macedonia learned about Feed My Starving Children through their involvement with the youth group at their church, Western Reserve Grace Church in Macedonia. Prior to that, Cassie and Joshua had traveled to Africa on a mission trip where they saw firsthand the poverty in that country.